Baltimore rapper Wordsmith is another talented emcee in a long line of musicians who make rap that hits your soul by way of the cerebrum, combining stylized vocals with hard-hitting hip-hop to deliver an album you could either place next to your Arrested Development and KRS-One LP's or between Frank Herbert's Dune and Yamamoto Tsunetomo's Hagakure in the philosophy section of your personal library. 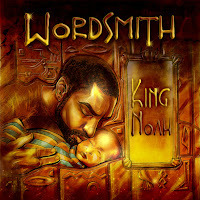 The album, King Noah, is Wordsmith's third solo project, dedicated to his latest, greatest personal success, an already highly respected, much-anticipated son known as Kingston Noah Parker. 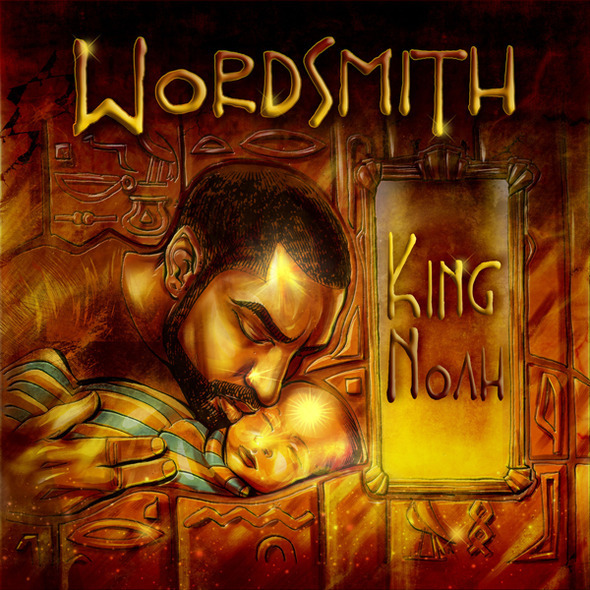 As a result, King Noah is both a solid rap album reminiscent of the old-skool productions that form the bedrock of modern first rate, intelligent hip-hop and an illuminating walk around the mindscapes of a musician, father and philosopher as he weaves words and music to make an LP with a positive message both to his son and to the youth of America. I use the term "positive message" not because it's a literary cliche' (technically, The Lord of the Rings has a "positive message" about chucking jewelry into volcanoes) but because you can't help but feel good as the album opens up with the title track, "King Noah" where Wordsmith tells his own newborn son how he feels just after the boy's birth. "July first, 2011 during the one o' clock hour. That's when my son, Kingston Noah Parker was born," he says, beginning a 4 minute, 20 second combination of insight into Wordsmith's own personal, spiritual perspectives and a shout out to the hopes he has for his own future generation. "Only peace and love can be the centerpiece," is only a small part of the message Wordsmith has for his son, which is vastly different from the usual creed most rappers give about their greater access to prostitutes, big bank accounts and firearms. Don't get me wrong, I love N.W.A. and I'm bowing down with Westside Connection. I don't judge the players, I just play the game, too. But hearing the joy and wonder in a father's voice as he speaks to his son about the power of peace and benevolent persistence is about as positive as it can get, without the usual mechanical sound of a 9mm being locked and loaded, or just gunshots in general. 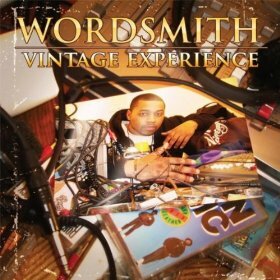 Wordsmith's music boasts a production value that's crisp and crystal clear. There's craftsmanship in each track. You can hear the quality not just in his third album's rhymes, rhetoric and lyrical ability but also in the cool beats and swank samples. Without going into too much detail, the record is born vintage and best appreciated on a sound system that does it justice, with a bass you can feel in your backbone five blocks away. 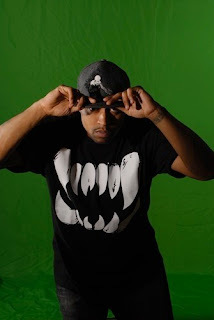 It's hard to believe the young artist began his career just a hip-hop, skip and jump ago with his first album, 2007's Vintage Experience, which featured tracks like "The Next Level Experience" where the rapper delivers lyrics with both authority and aplomb that speak of the harsh reality of how hard it is to make it in a rap industry that grinds out the good along with the goons. Another writer wrote that Wordsmith is a thinking man's emcee, but a lot of rap has a rep for being think man's music. Back in 1993 Arrested Development wrote songs that got you thinking with their album, 3 Years, 5 Months & 2 Days in the Life Of... which practically required a history text in one hand and a genuine appreciation for the subtle nuances of inner city slang in the other. There were also groups like De La Soul who composed songs like "Me, Myself and I" that were more philosophical than boastful. By the time KRS-One wrote "Self Destruction" a lot of other hip-hop artists knew that young black America needed to wake up, and rap was a good alarm bell to do it with. That's not to say that Wordsmith wastes words by preaching to the proselyte about what the herd has heard before. He's better than that. Maybe it's because when the tracks on King Noah open up with his own personal message to the youth, there's no arrogance or ego. When he talks about the evolution of his career in "Music for the Masses" he wants his son to understand the responsibility even a successful musician has to the world with the ethics he practices. "On My Job" warns of the evils of money, but reminds us all that while labor is bitter, dreams are sweet. "With you being a Parker man," he says, "one thing you need to know is we work hard." 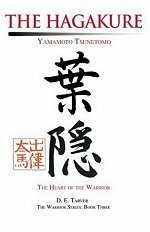 "Generation X," the third track, is not only about the importance of leadership but how the world really needs good leaders with solid ethics, not just powerful ones, which is the same sentiment expressed by Yamamoto Tsunetomo hundreds of years before, when he penned his own treatise in order to inspire young professional warriors to act with honor. When you read books like the Hagakure or Dune, there's a similar feeling that you get when listening to rap albums by artists who don't just want to make a fast buck, but want to make something that's a bedrock for a better society. The authors of those books wrote about relationships between father and son, one generation to the next, emphasizing not only the virtues of a previous generation but the importance of virtues, which transcends generation, genre and geography. 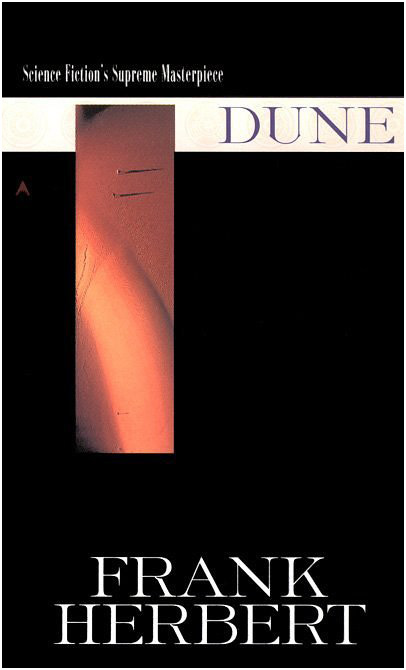 Wordsmith has a message that preaches traditions like honesty, integrity and loyalty, but with the same experienced, strategy-laden advice Duke Leto Atredes gives to his son Paul Atredes in the science-fiction ultramasterpiece known as Dune, an awesome literary menhir full of advice that contains philosophies that parallel Wordsmith's own experienced observations. Both men want their sons to make their mark upon the world, to attain power, but with the patient wisdom that only comes from loving benevolence and selfless, transpersonal commitment. That's a beat we all need to rock to. King Noah won't put you to sleep at the wheel like some sort of recorded dissertation, though. 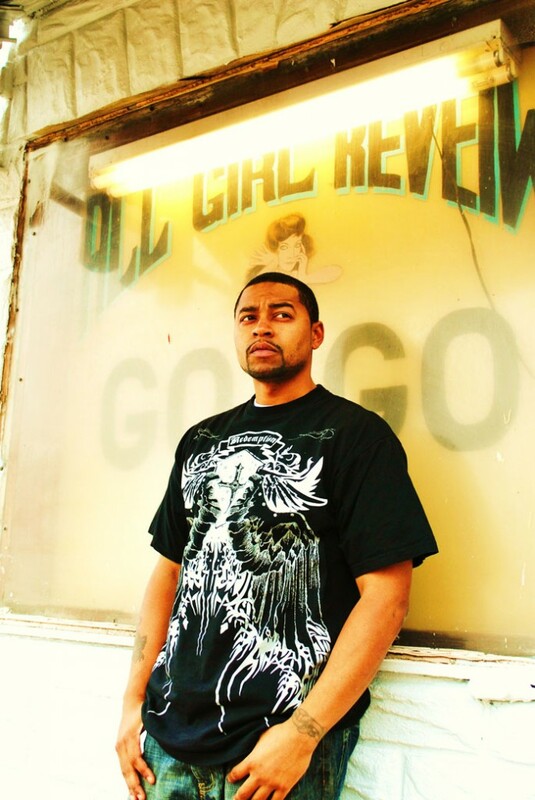 Wordsmith has brought on A-list talent to make this album happen including artists like ELiM, Phil Ade and K. Sparks. 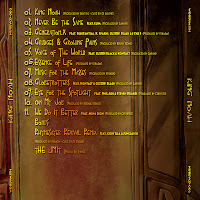 The album has jazz-laced beats, innovative rhythms and enticing samples mixed with honest, poetic lyrics about racial profiling, dealing with haters, enduring the blues and going after your dreams combined with an excellent production by Centric, Capish, Certified, Rednaz Beats, Strada, DJ Eclipse and Benny Rome. 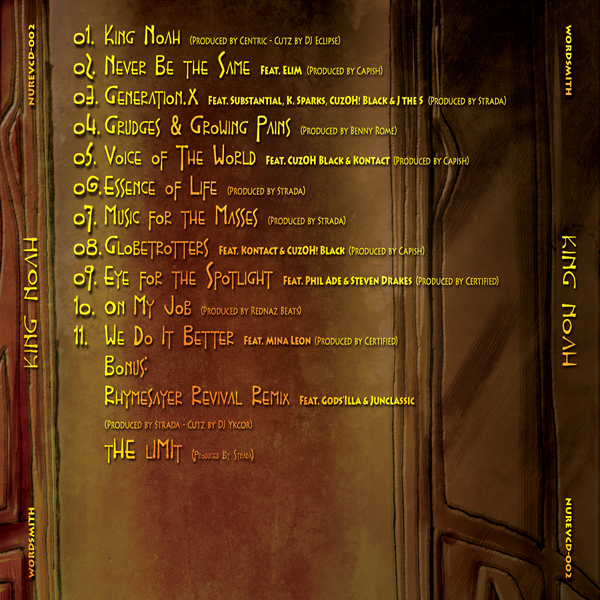 To hold the LP is to have a handful of iron-strong, anvil heavy hip-hop. My advice is to invest. King Noah will be available on June 19th. You can follow Wordsmith on Twitter right here. You can like him on Facebook right here.